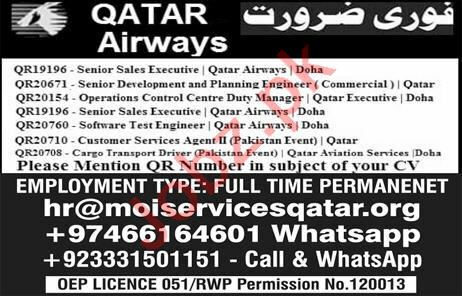 Qatar Airways is inviting experienced and energetic candidates for the posts of Senior Sales Executive, Senior Development Engineer, Senior Planning Engineer, Operation Control Centre Duty Manager, Senior Sales Executive, Software Test Engineer, Customer Service Agent, Cargo Transport Driver in Qatar. Interested candidates can contact for further information. You can apply online at vacancy after registering at http://www.jobz.pk site. DEAR SIR,I WANT TO APPLY FOR THIS JOB.PLEASE HELP ME MY QUALIFICATION IS GRADUATE. Dear. Right now Im here in Dubai I have five years experience for document controller and customer service jobs.